I made some headers. I like them. I will now share them with you. Publicis wants a header for some internal communication thing and they told me to design something, whatever I want, and see what happens. I think the two designs I came up with are pretty rad. I’m awful proud (puffs chest). In case you care, I used Illustrator for everything except the word “news”. I used CorelDraw for that. I find their 3-D capabilities far better than Illustrator. I know no one agrees with me, but whatever, it works better for me and there you go. Apartment and two things I saw walking around New York. This is what my apartment looked liken when I moved in. Boxy. Very very boxy. Well, now I’m down to three boxes. Three boxes, people! The finish line approacheth! Soon I will have pictures of the niceness with the wall hangings and whatnot. I walk past a deli on my way to work that has a poster on the door. I noticed it the other day. Look. I realize that it’s supposed to be that the soup is so good, the design of angels on the bowl cannot resist and one of the angels is partaking via a straw. 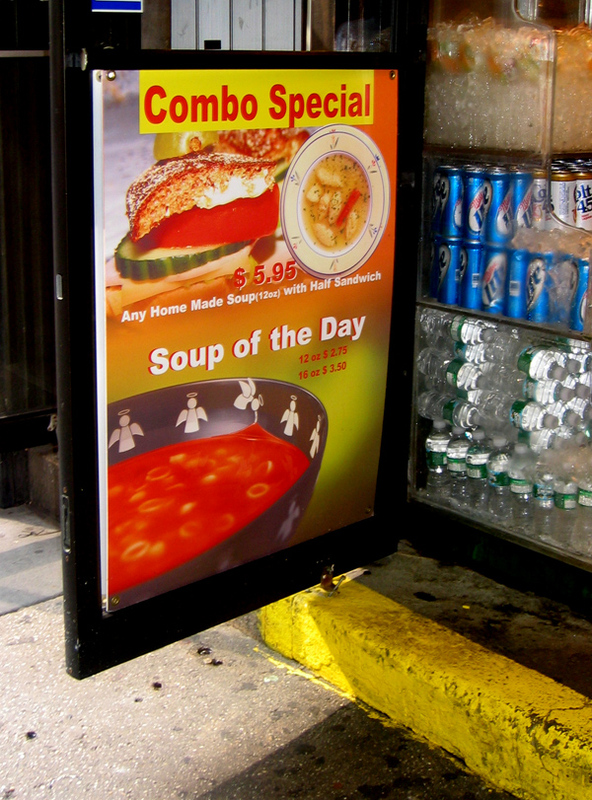 What I was convinced I saw the first six or so times I walked past it was that the angel was vomiting into the soup, and since the soup was made with angel vomit, it was heavenly, sort of. I’m not making this up. I swear that is what I thought. “Tomato Basil, now with transcendental emesis!” So not right. I see this every day on my way into my building. I’ll keep this short: I hate it. I hate it a LOT. The pointy teeth in many rows, the red shiny gums, the psycho expression, the water running off him that looks like sweat… this is the makings of nightmares. See what I mean? Thankfully it’s Shark Week right now, so hopefully the sign will be replaced soon. Really soon. Like tomorrow, that would be nice. 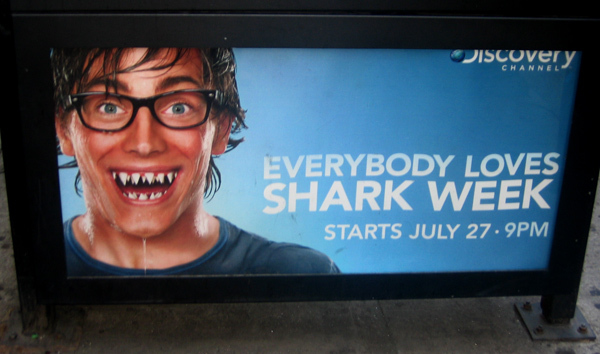 Addendum: July 30th – This morning they had replaced the Shark Week poster with a Mythbusters poster! Now, the Mythbusters poster has Jaime and Adam’s decapitated heads in jars like specimens, but it’s still a big improvement over Toothy McRedGums. I am happy. B. sent me this, and I think it’s really terrific. It keeps your interest the entire time. An animated version of an interview with John Lennon. Reviews of Penelope and Hellboy II. I think she looks kinda sweet. It really hurts one’s self-esteem when someone who looks like Christina Ricci (hot) with a pig snout (cute) is treated like a leper whose critical parts have fallen off. 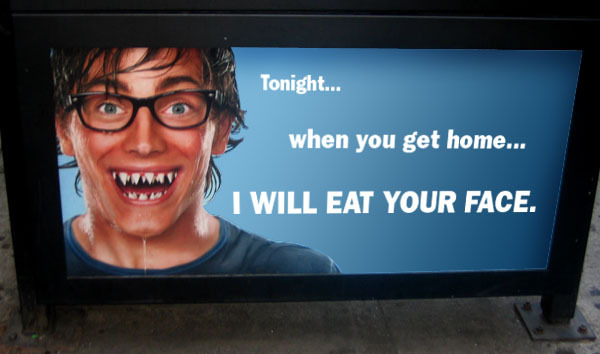 It made me not want to go outside for fear people would hurl themselves in front of buses. But other than that, good film, you should rent it. 2. Hellboy II. Yeah, there’s a plot. It’s not good. And the dialogue, that’s not good either. But the costumes and special effects are phenomenal. Guillermo del Toro is very similiar to Julie Taymor (the woman who came up with the costumes and sets for Lion King on Broadway). I recommended afterwards that one should rent Hellboy II, turn the volume off and play Nine Inch Nail’s “The Downward Spiral” while watching the film. That would be perfect. One thing I thought was a bad design decision was this: there are elves, and when they die, they turn into stone sculptures. The problem is the stone sculptures are cream/yellow-colored, so they look identical to a butter sculpture of Garth Brooks from the Iowa State Fair. So one of them dies and we the audience are supposed to be moved, and I’m sitting there trying not to think about smearing these elves on toast. But the troll market sequence is gorgeously designed and very textural and visually stimulating, so that’s terrific. If you’re wondering why I didn’t see Batman, it’s because it was sold out until 1:00 a.m. and the lines were out the door. The IMAX is sold out for another two weeks, so eventually I’ll get around to seeing the damn thing. Then I’ll comment on whether it is worth all the hoopla. 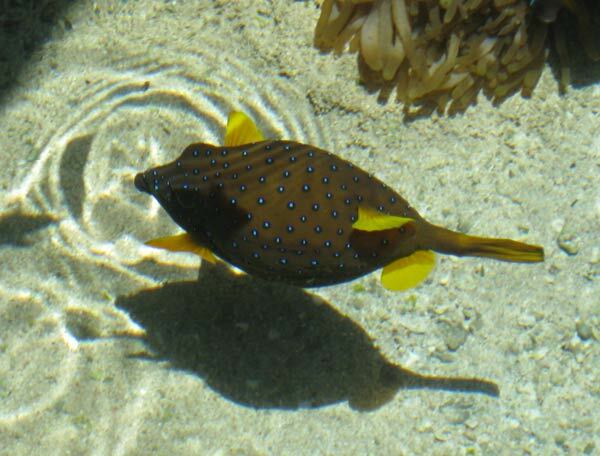 The Happening, Back to School, and Nudibranches, oh my! 1. I saw The Happening, the new M. Night Shamalamadingdong film. (Side note: who here cannot stop thinking of “The Bloodening”, the fictional Simpsons horror film, every time they hear that title? Just me? Okay.) For anyone living without the benefit of the internet, newspapers, television or semaphore, The Happening is what happens when plants have had enough of humans and their crappy destructive ways. They release a pollen/spore/icky airborne that causes people to kill themselves (in super-creative ways, a guy runs over his own head with a combine). I know I’m supposed to be rooting for the humans, but I was, well, not. If I was a plant, I would be testy about humans as well. While this was not M. Night’s best film, he sure does know how to increase tension with creaking branches and rustling leaves. I came home and said to my houseplants, “If you don’t start nuthin’, there won’t be nuthin’, k?” Gotta keep an eye on those houseplants. 2. I was at Target the other day and they were all kinds of hawking back-to-school supplies. I realized at that moment how blissful it was to not care about going back to school. I went to school for seventeen years of my life (kindergarten, 1 through 6, middle school, high school, college) and I do not miss it one bit. If I want to read the collected works of Bloom County and Foxtrot all summer, I can. I don’t gotta write no paper at the end either. Oh, and when I was a kid my mom would make me go to summer camp, so I would have to get up early every day anyway. Now, I get paid to do that. Oh yeah. Being an adult rocks. Now don’t get me wrong, I still take classes periodically in various programs so I can be a better designer. But it immediately causes me to make more money, which I can then spend on books which contain pictures of Opus the penguin wearing a sun hat. Kids? Stay in school. So that you can earn a decent living so you can buy a computer and only read blogs if you want to. A nudibranch is a member of one suborder of soft-bodied, shell-less marine opisthobranch gastropod mollusks, which are noted for their often extraordinary colors and striking forms. The suborder Nudibranchia is the largest suborder of heterobranchs, with more than 3,000 described species. 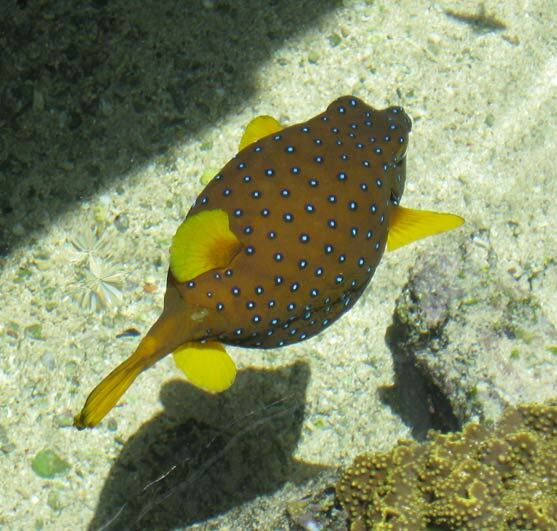 The word “nudibranch” comes from the Latin nudus, naked, and the Greek brankhia, gills. Nudibranchs are often casually called “sea slugs”, a non-scientific term which has led some people to assume that every sea slug is a nudibranch. However, while it is true that nudibranchs are very numerous in terms of species, and are often very attractive, there are numerous other kinds of sea slugs belonging to several taxonomic groups that are not very closely related to nudibranchs. 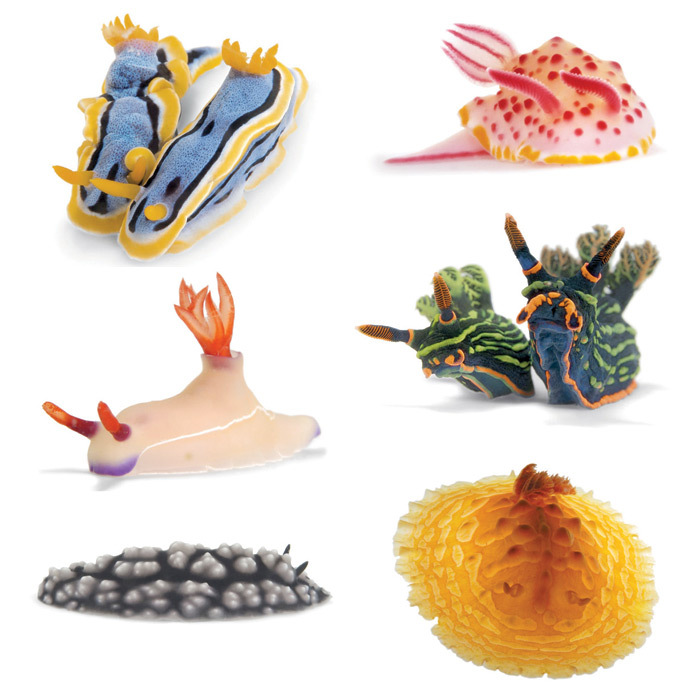 A fair number of these other sea slugs are colorful and thus are even more easily confused with nudibranchs. I don’t care how creative you think you are, you cannot top this. I will never make anything that interesting or fascinating to look at. And I’m alright with that. And you should be too. Let’s all hug. A post all about my new apartment. This will be interesting to no one but me. And another TV just like it, except a bit smaller. Free. Nice rarely-used televisions. Rubbish. Since the big one says SONY on the bottom, I call the TV Sonya. I will paint an “A” on it soon. And, as anyone who appreciates “Little Shop of Horrors”, I’m naming the other TV… Sonya II. Now I’m in the midst of putting things where they belong. I spend a couple hundred dollars at The Container Store buying stacking metal drawers and wall racks and all sorts of organizational tools. I realized I’m becoming THAT PERSON. You know how you laughed at Grandma with the plastic on the furniture? I used to laugh too. This last week, I actually considered covering my living room furniture in plastic. My mom had to slap some sense into me. This morning I was late for work because I had to lower the blinds in all my rooms so the furniture and rugs wouldn’t bleach from the sun. THAT PERSON. I have placemats and coasters. I don’t even know myself anymore. Perhaps I will leave a bowl of water and a scrub brush near the door so visitors can not only remove their shoes, but scour the soles of their feet as well. Oh dear God, I need help. I am typing this from my super-pimped out fabulous apartment. 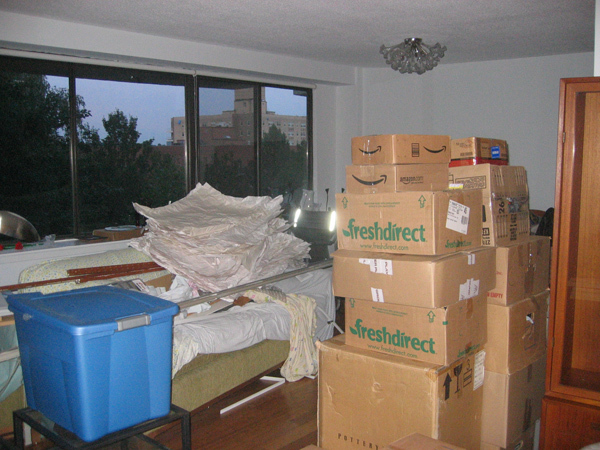 I moved in on Friday and am now ensconced in a flurry of unpacking. I realized yesterday that 75% – 80% of my boxed possessions are decorative items. I am a master of ornate uselessness. My apartment is going to look like a gift shop, but I don’t care. It’s set up just the way I like it and I have to take no one else’s opinions into consideration. BLISS, I tell you. As soon as I’ve set it up somewhat and it stops looking like I have the Great Wall of China made from boxes in my living room, I will post pictures. Two songs that are forever altered in my mind. 1. I do not, as a rule, care for Mariah Carey’s music. It’s just not my cup of tea. However, I listen to a great deal of pop or R&B stations, and they play her stuff. So I know it. I know some lyrics and everything. She has a cover of a song called “Without You”. “American Idol” is not unique. Bulgaria has “Bulgarian Idol”. And they have the same audition process, with the talented people. And the not-so-talented people. 2. If you remember back a ways, there was a song on the radio every fifteen minutes called “Torn” by Natalie Imbruglia. You could not avoid it. You could not hide from it. It was all-pervasive. A British comedian heard the song and came up with a mimed act based on the song that is BRILLIANT. Now, I can be falling asleep and my clock radio will play that song and I have to roll over onto my back and mime all the motions I can remember. Every time. Luckily the song doesn’t come on the radio very often, but when it does, I must mime. I cannot resist. And a bonus: Here’s Natalie Imbruglia performing the miming with him! What a good sport. WALL•E and some snippets of Israel I forgot. Quick summary of WALL•E: I started weeping ten minutes in. At one point I turned to my sister and said, “Schindler’s List was less depressing than this.” The pathos, the pathos is thick, my friend. You’ll empathize your heart right out of your chest. Go at your own risk. There are a few shots from Israel that I forgot to share in the previous posts. Please to enjoy uncategorized pictures. 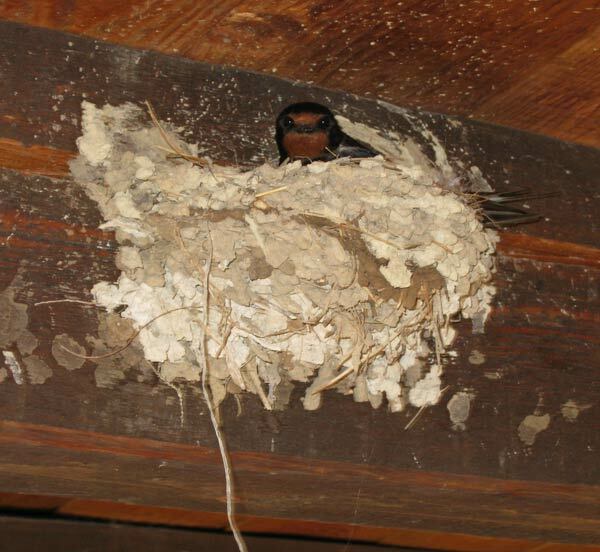 It’s a bird in a nest made from mud and poop! The birdie’s looking right at us! Isn’t that cute? The bird wasn’t more than six feet from my head. I was very happy. 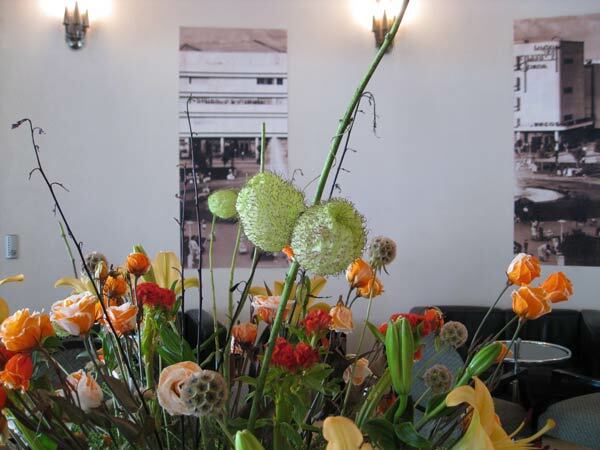 There was stunning flower arrangement in the hotel foyer. The florist incorporated these big poofy pods filled with air covered in hairy hooks. I was staring at them when my mom chimed in, “Oh, those are called ‘Old Man’s Balls'”. That’s great. Thanks, Ma. From then on every time I walked into the hotel I averted my eyes. Couldn’t they call them “Septuagenarian’s Nards” or something not quite so… blunt? 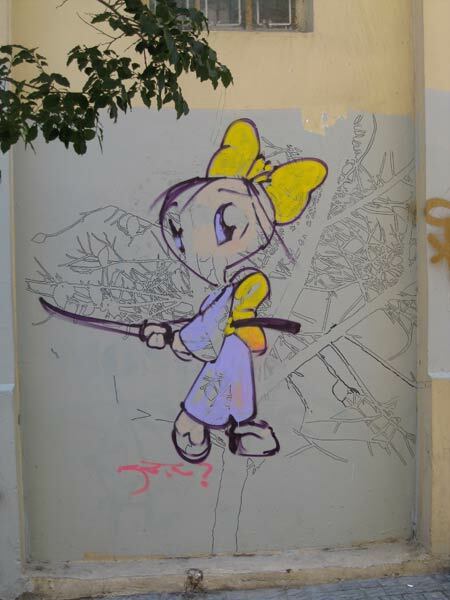 Check out this cool piece of graffiti. Ignore the super-kawaii ninja-girl for a second. See that tree in the upper left-hand corner? Apparently someone came at night when the streetlight was behind the tree and traced the shadow for a hour or so. How cool is that? That’s one of the few wonderful things about stucco and cement: you can apply terrific graffiti with ease. If I wasn’t so afraid of getting in trouble with the po-po, I would put nifty illegal outdoor art up in places. Anyone who’s ever seen me in person knows what a big deal a tan is. I am often mistaken for the Michelin Man, or a portly corpse, or that Pillsbury Dough Boy ghost in Ghostbusters. Squishy and white, that’s my M.O. So a tan is news. 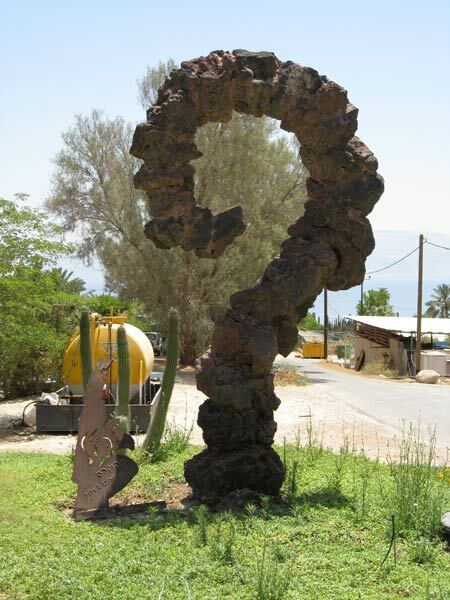 There is a lovely kibbutz/arboretum in the middle of the desert called Ein Gedi. It was founded in the 1950s, so a great deal of the cactuses (that’s what they specialize in) are over fifty years old. 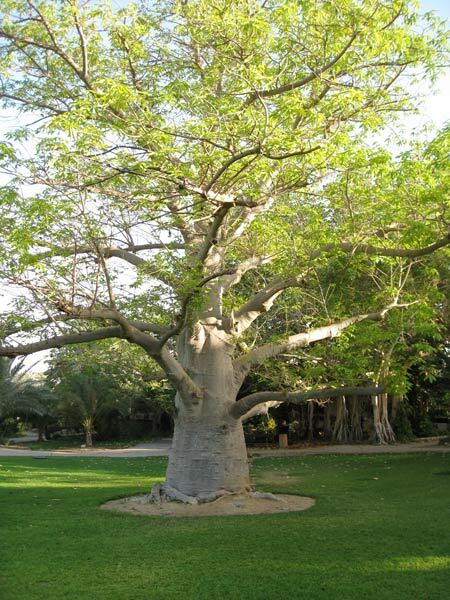 They also have baobab trees (literary reference: The Little Prince). 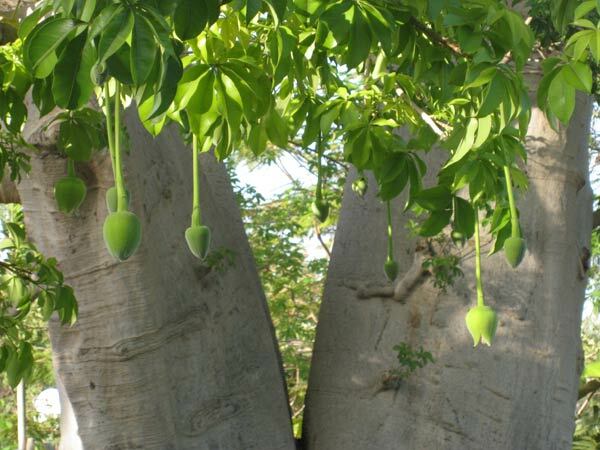 I learned that baobab trees have weird fuzzy fist-sized pods hanging from their branches and that cream of tartar (a thickening agent used in meringues) comes from these pods. … looked like a big curly turd. Anyone else see that? Anyone? Big poo? Anyone? 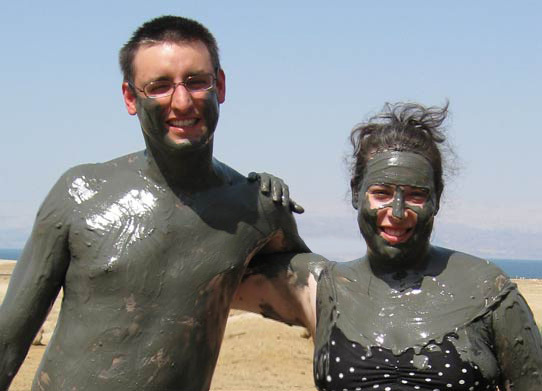 Right near Ein Gedi is the Dead Sea, also known as the lowest point on earth. I’d been a number of times, but Cricket needed to experience this, so we went. And it ended up being one of the worst experiences of my life. Allow me to explain. The Dead Sea is a giant crack in the middle of mountains. When it rains at the top of the mountains, the water runs into the crack with all the minerals it has collected on the way. Once the water and minerals are in the crack, the water evaporates and you’re left with a great deal of crunchy minerals, mainly salt. 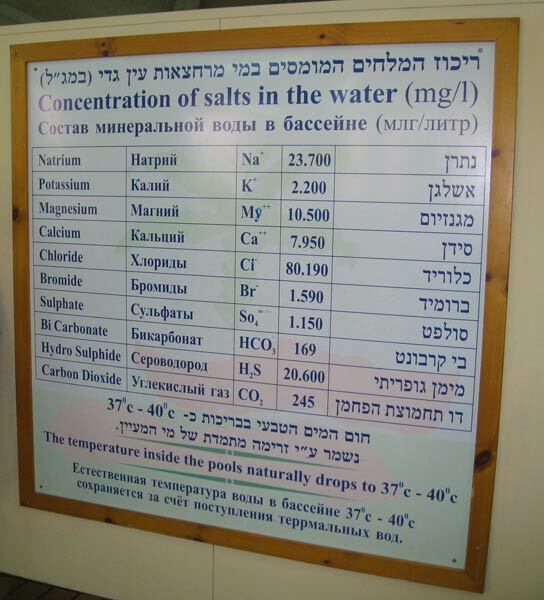 The water that’s left in the Dead Sea is so salinated, if you drink a small glassful, you die. 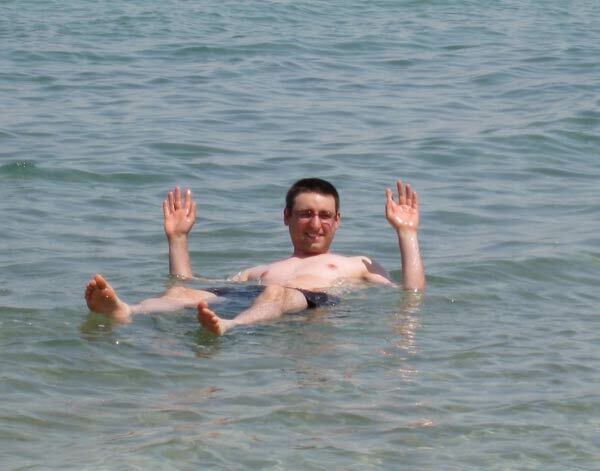 The other cool thing about the Dead Sea is that you float almost right on the surface. Cricket will now demonstrate. 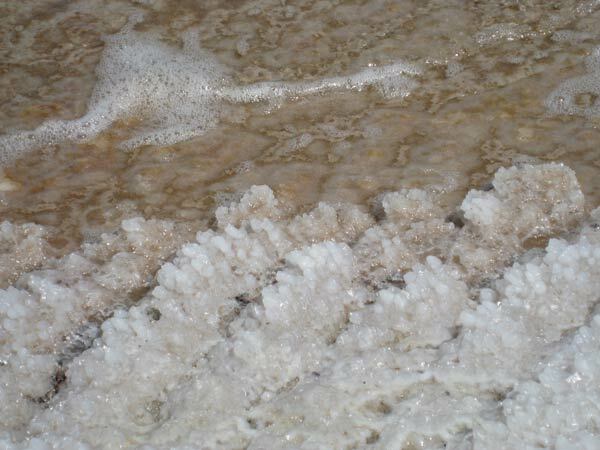 Here is a picture of the shore with the salt crystals. Mmm, mmm, don’t we look so pretty? Anyway, we then baked in the sun until we were dry and I walked over to the big pipes to wash myself off. I just stepped right under them. And then I learned the difference. The water coming out of the showers was fresh water. 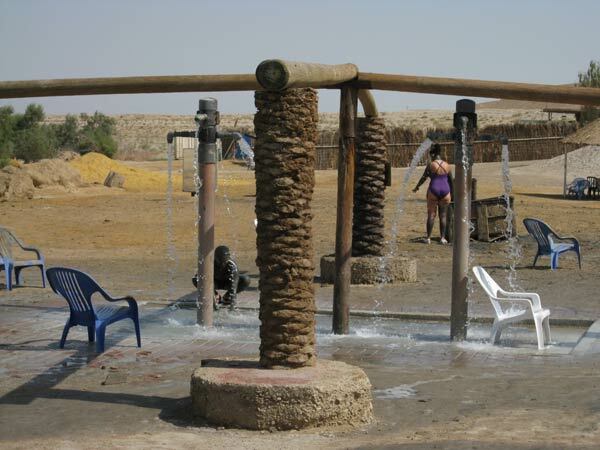 The water coming out of the pipes was HOT SULFURIC SALTY SPRING WATER. It tasted like someone had left some hard-boiled eggs in the sun for a week, then brewed a nice steaming cup of tea with it, put some salt in it, and then threw it in my face. I started shrieking for Cricket to bring me a towel. Then I wiped my eyes and zipped over to the fresh water shower and yanked that chain like sixty times trying to get the rotten-egg taste and smell off of me. Which I couldn’t. Apparently the sulfur stays in your hair follicles, so every so often I would catch a whiff of my hair and it would take me right back. I took a photo of the list of ingredients of the spring water so that you can appreciate how much it sucked (a lot). Isn’t he lovely? Here he is from another angle. I went snorkeling for the first time and it was wonderful. I love fishies and there were many of them and they were nifty. 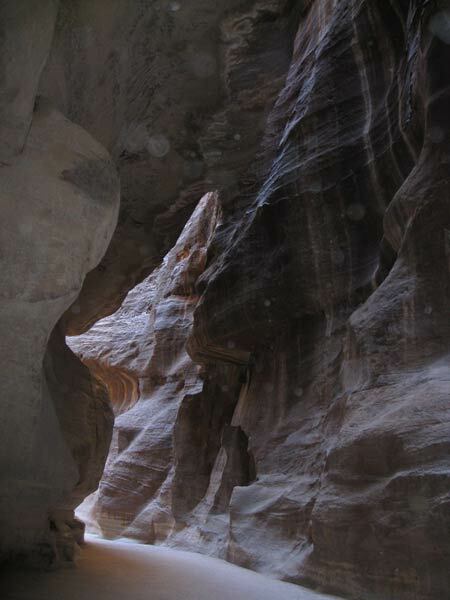 One of the days that we were in Eilat we went to Petra. Petra is in Jordan, so we had to do the whole Visa thing with the sitting around waiting to get stamped thing. 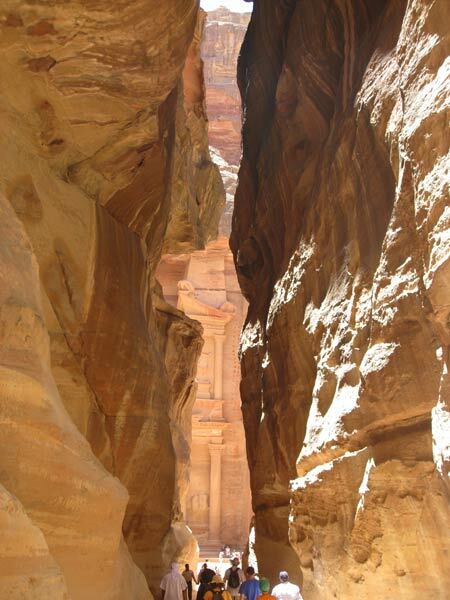 No one knows how old Petra is, but we’re thinking real old, like Old Testament old. It’s a necropolis, or City of the Dead, or Big Fancy Cemetery. 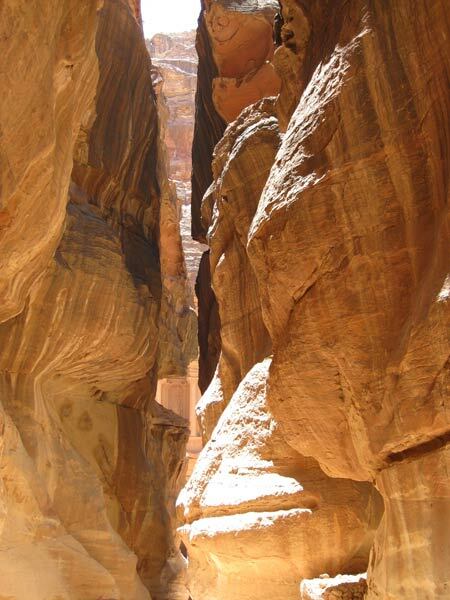 You walk for a third of a mile through this little corridor through the sandstone. 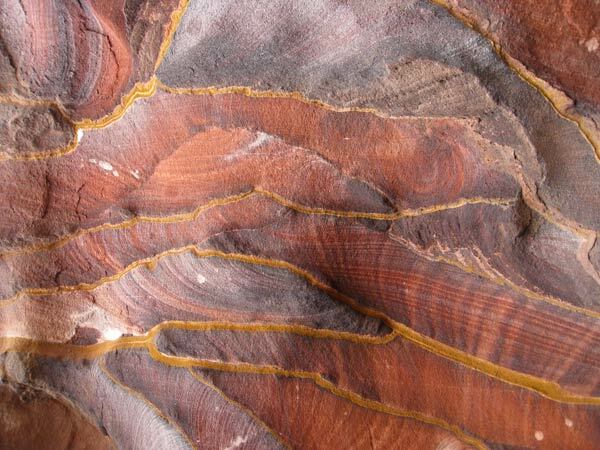 And the sandstone is all different shapes and colors. I think if Walt Disney saw he would say, “No, looks a little too fake”. And then- Blam! You are faced with a giant ornate Greek-looking building that is totally out of place. It’s called The Treasury. The more important you were, the fancier your tomb was, so this guy who was buried here must have been very important. See those little divots carved on either side of the facade? Because sandstone is so crumbly, they carved from the top down so as not to touch what they just carved, but sometimes you need a little additional carving so the little divots are steps for carvers to climb up and do changes to the top without touching the front. Very interesting. 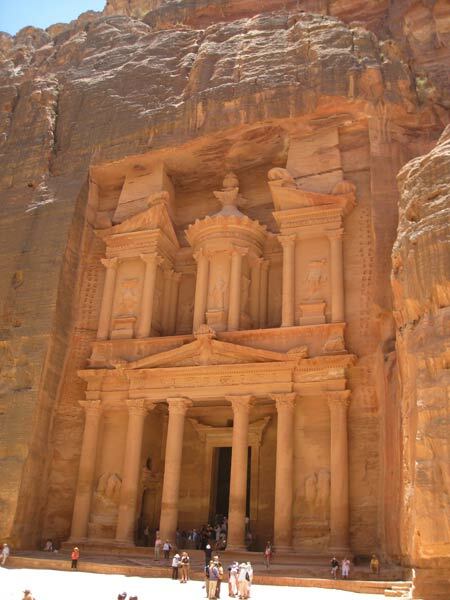 There were a few other tombs, some for important people, some clearly for Bob the Stinky Homeless Bedouin (just a niche in the rock, no ornate nuthin’) but the Treasury is really the piece de resistance. That’s my trip to Israel in a nutshell. If you have any questions or want to see any more pictures, I have 475 pictures that I would be happy to share with you. You are currently browsing the design-newyork.com blog archives for July, 2008.